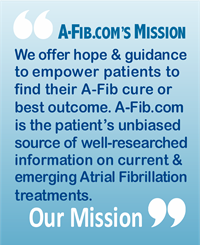 The content of this website, Atrial Fibrillation: Resources for Patients (A-Fib.com), is provided “as is” for general information only, and is not intended as medical advice. 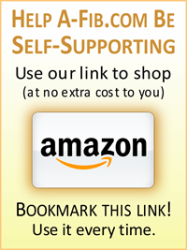 Hypertext links to other websites are provided for your convenience and are not intended as an endorsement by A-Fib.com. 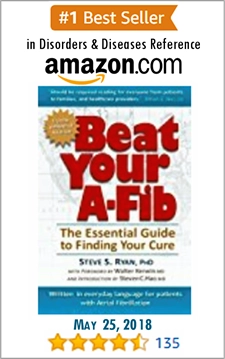 The publishers of A-Fib.com are not medical doctors and cannot guarantee 100% accuracy of medical information offered. 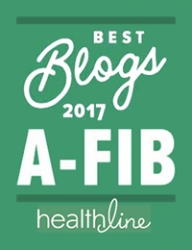 A-Fib.com does not recommend, endorse or make any warranties regarding the accuracy, completeness, timeliness or efficacy of any material or information provided by this site. All email, written or oral communications with the Publishers/Editors is not intended as medical advice. The author of each personal experience story is solely responsible for their expressed opinions. 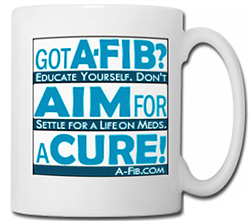 Unless otherwise indicated, A-Fib.com holds the copyright to all materials on this site and owns all trademarks, service marks and logos. 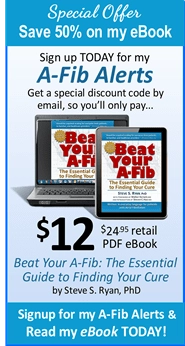 By accessing the information on this web site, you agree that A-Fib.com or the contributors of information to this site shall not be liable to you for any loss or injury arising from your access or use of this site or other sites to which it is linked. The content on this website is licensed under a Creative Commons Attribution-ShareAlike 4.0 International License © Steve S. Ryan, A-Fib.com. Some Rights Reserved.